Breast cancer patient Jennifer Burke talks with Delnor Hospital Nurse Navigator Nedra Reeves, who offers a listening ear and sound guidance. Attention to women’s health concerns has steadily increased over the past few decades. Among other things, better-funded research has led to major advances in diagnosis, treatment and cures. Also, the health care focus has broadened, from merely treating disease to meeting the needs of the whole woman. But one of the most powerful health care tools can’t be measured: awareness and open discussion among women about the conditions they encounter. Because of their reproductive role, women are vulnerable to a unique set of diseases, with breast cancer at the forefront. While a small percentage of men are diagnosed with breast cancer, it remains predominately a woman’s disease. As a breast nurse navigator at Delnor Hospital in Geneva, Nedra Reeves, RN, knows what it takes to help breast cancer patients face their fears and deal with the confusion that comes immediately after receiving a cancer diagnosis. Along with surgical procedures and medical treatments, patients need help when it comes to issues like knowing how to talk with their children about cancer. Reeves facilitates a support group at LivingWell Cancer Resource Center, a Delnor Health System affiliate that supports patients in just this way. LivingWell offers support programs to cancer patients and their families, including exercise, yoga, cooking and nutrition, massage therapy and counseling. Jennifer Burke, a breast cancer survivor and Delnor patient, believes it is crucial to have someone with a good pair of ears and an understanding of what breast cancer patients go through. Burke was diagnosed with breast cancer in late summer 2009. Married with two sons, it was hard for her family to deal with her being out of commission for long periods of time. “I had two surgeries about two weeks apart that August,” she says. “I was frantic. School was about to start and I hadn’t even bought the boys’ supplies yet. I really had to scramble.” Along with Reeves, family members and friends, Burke’s church family helped her tremendously. 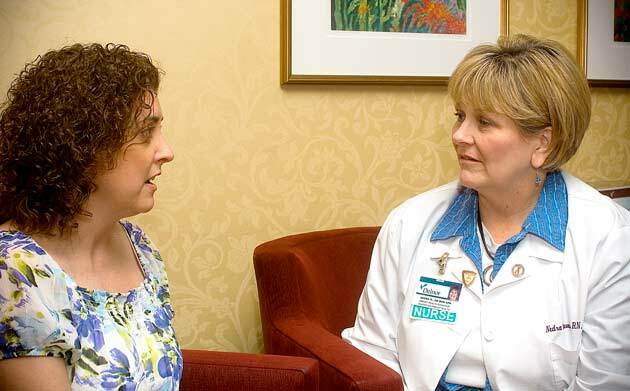 Dr. Kelly Simkins, shown here consulting with a patient, says the incidence of cervical cancer has decreased 50 percent over the past 30 years. As a breast cancer survivor, Burke has a mammogram and ultrasound every six months, at the Delnor Center for Breast Health, plus an annual MRI, along with radiation and oncology follow-ups. She’s also being treated for a post-surgery condition. Cervical cancer is another major concern that health-savvy women are mindful of. But Dr. Kelly Simkins, DO, OB/GYN, says its incidence has decreased more than 50 percent over the past 30 years. In her offices in Barrington and Crystal Lake, as well as through her practice at Advocate Good Shepherd Hospital in Barrington, Simkins sees patients who are conscientious about regular check-ups and immediate treatments. “There are no obvious symptoms of cervical cancer,” she explains. “I see patients day in and day out who are at risk of having human papillomavirus (HPV), and that’s why PAP smears are so important.” Cervical cancer can be connected to HPV. While there are hundreds of types of HPV, about 75 percent of cervical cancer cases are caused by HPV Nos. 16 and 18. When a PAP smear biopsy reveals an abnormality, the patient may be sent back to her physician for a colposcopy. This procedure is usually done in the physician’s office. Left undiscovered and untreated over many years, the presence of HPV within the cervix can eventually lead to cancer. While cervical cancer is always a traumatic diagnosis, it is less common than it once was. This is good news for women concerned about cervical cancer, Simkins says, but patients come to her with many other reproductive system problems that can be troubling as well. Blood tests, ultrasounds and cultures help to determine the cause. In most cases, the condition can be addressed with hormone treatments, medications for infections, outpatient surgery, or major surgery. Another health concern faced by women of all ages is uterine fibroids, small benign fibrous tumors that occurs on the muscle walls of the uterus. As an interventional radiologist, Dr. Tami Carrillo sees patients daily, at Provena Saint Joseph Hospital in Elgin, whose symptoms point to this sometimes debilitating condition. 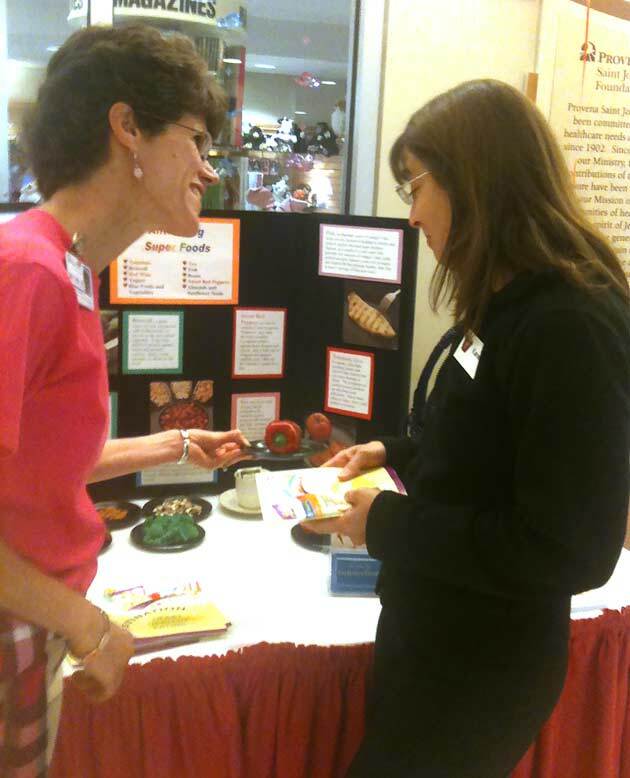 MaryCarol MacDonald, left, a registered dietician at Provena Saint Joseph Hospital, reviews antiaging foods with an attendee of the Laugh Out Loud and Love Our Lives (LOL) event in April. Depending on size and location, uterine fibroids can cause unusually heavy menstrual flow during, and even between, periods. Symptoms can include constipation, difficulties with bladder control, frequent urination, unexplained weight gain, and bloating. A patient’s OB/GYN or primary care physician may suspect the fibroids and order an ultrasound or MRI to make the diagnosis. CAT scans are not always reliable for diagnosis. Myomectomy is a minimally-invasive surgical procedure in which a video camera is inserted through tiny incisions to locate the fibroids, which the surgeon then removes laparoscopically. Unfortunately, if the fibroids are difficult to reach, the surgery may end in a traditional hysterectomy. While patients may fear that this procedure might also close down vital blood flow to the rest of the uterus, Carrillo emphasizes that the uterus has no problem developing new blood supply routes. She adds that the only downside to embolization is the initial pain that patients experience while fibroids are dying, along with the possibility of nausea and light spotting. If I had to make a choice, I would choose embolization first,” she concludes. Given the unique health issues women face, it’s vital to make them aware of how to recognize and even prevent them. This April, Provena Saint Joseph Hospital’s Women’s Services presented “LOL: Laugh Out Loud and Love Our Lives,” a day-long event that focused on heart health and hormone therapy; non-surgical and minimally-invasive procedures; overall breast health; and stress relief. Technical advances, awareness campaigns, outreach educational programs, networking and resource development are all tools for encouraging women to be proactive about their personal health. But a little incentive doesn’t hurt, either. To provide an incentive for women to pay closer attention to their health, Centegra in McHenry has teamed with Dalzell Jewellers in Crystal Lake for an Add-a-Pearl for Health and Wellness program. Women receive a freshwater cultured pearl for scheduling appointments or attending classes. Centegra Health System in McHenry is providing that incentive, with introduction of its Add-a-Pearl for Health and Wellness program. Women who register for services, such as annual physicals, mammograms screenings, bone density exams and select classes at Centegra’s Bridge Fitness Center, are rewarded with a genuine, cultured, freshwater pearl they can use to build a keepsake necklace. For this special program, Centegra has teamed up with Dalzell Jewelers in Crystal Lake. Women can register for the program at centegra.org/pearl. Then, at the conclusion of the appointment or class, they’ll receive a drawstring bag containing the pearl and instructions on how to get it strung onto a micro-cord necklace for $5 at Dalzell Jewelers. This entry was posted on Friday, May 20th, 2011 at 11:00 am	and is filed under Health & Fitness. You can follow any responses to this entry through the RSS 2.0 feed. Both comments and pings are currently closed.